The only thing that keeps the company survives in a competitive business environment is because of their customer’s satisfaction. And they should take good care of it because if not, It will deteriorate their customer service, their product, and most importantly, the life of their business. They don’t want that to happen. So, if you own any business, the only way you can prevent this is by having a regular customer satisfaction questionnaire. 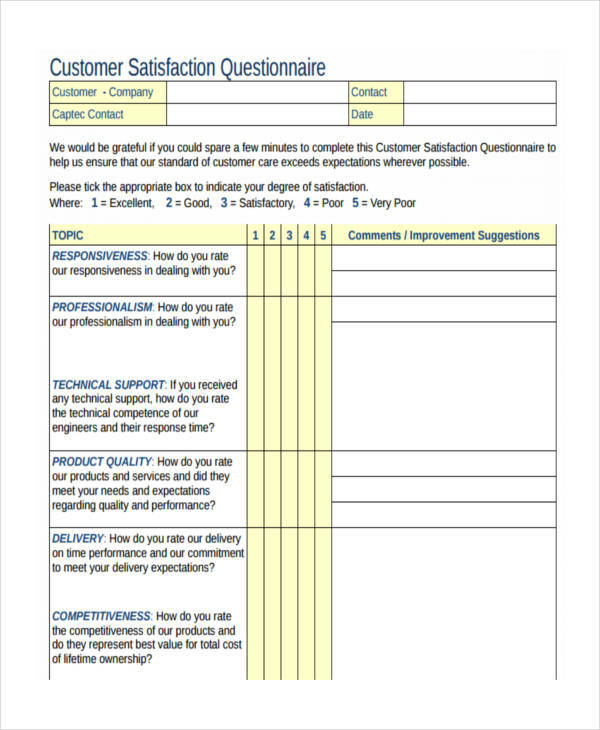 The customer satisfaction questionnaire Examples will be the foundation of how you provide your service and product. And this will be your guide on making future decisions that will improve your business. 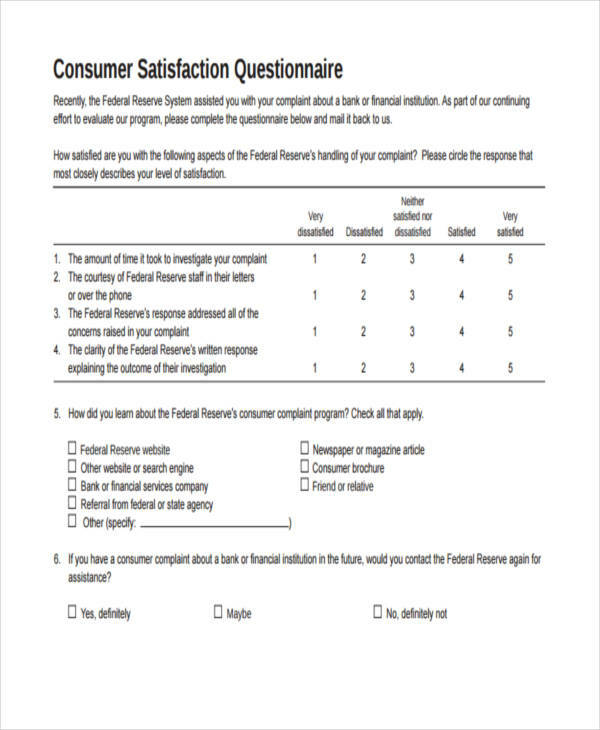 What Is Customer Satisfaction Questionnaire? 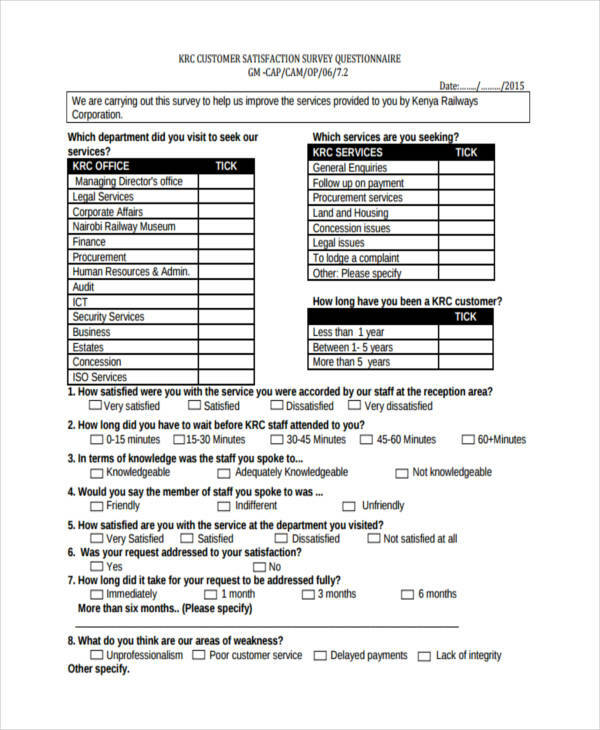 A customer satisfaction questionnaire is a type of questionnaire that contains questions (usually in a rating scale format) to help the companies measures the satisfaction of their customer of the service they offered or the product they provide. This questionnaire is essential to every kind of business because the customer satisfaction ratings can have a huge impact and powerful effects in almost all company. 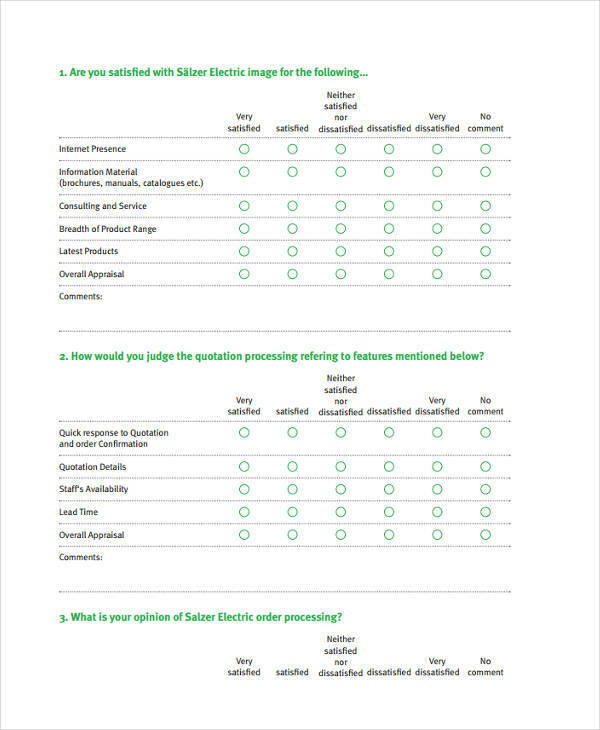 The purpose of this questionnaire is to rate how satisfied you customer are. The happier they are the more likely your company will increase its number of loyal customer and increase the company’s revenue. 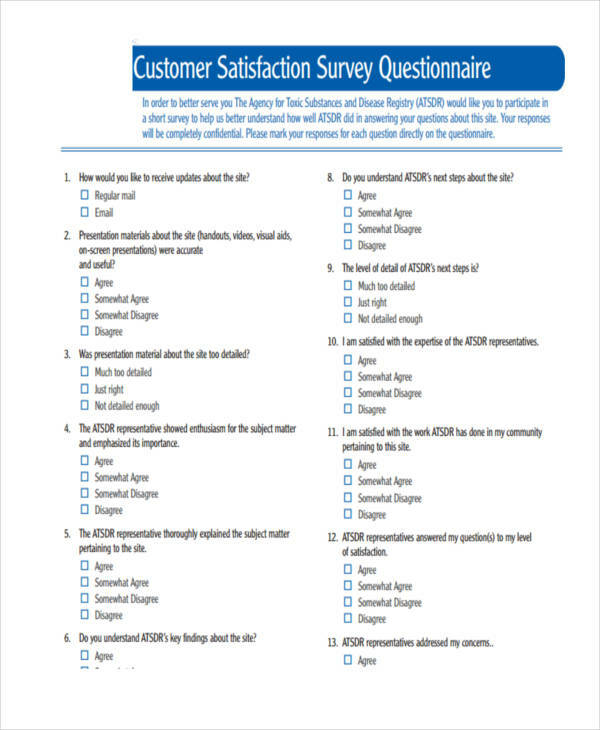 Check out our customer satisfaction questionnaire examples in Word to give you more ideas. 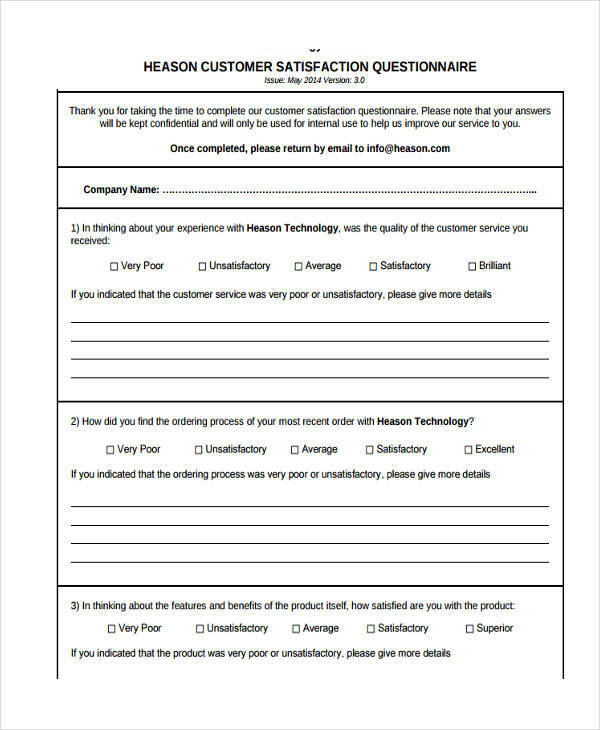 A customer satisfaction questionnaire plays an important role in keeping the company on track and directing it towards success. But not only that, here are other reasons why a customer satisfaction questionnaire is important in every company. It improves your company’s marketing and financial strategic plan. You can determine what areas in your company need to improve and what needs to retain. It increases customer lifetime value and measures your company’s results. You can get new insights and ideas from your customer. It identifies if you are providing significant and relevant service to your customer. Creating a customer satisfaction questionnaire can be a bit of hard task, but it is worth your time plus it gives you valuable insights that can make your company even better to your customer. So, here are few of our tips to create a customer satisfaction questionnaire. Keep your questionnaire short. We all know that most of the time, if the questionnaire is too long, it gets ignored by the customer. So to avoid this, make your questionnaire short that takes only 3 minutes or less to answer. Ask only questions that relate to the satisfaction of the customer. 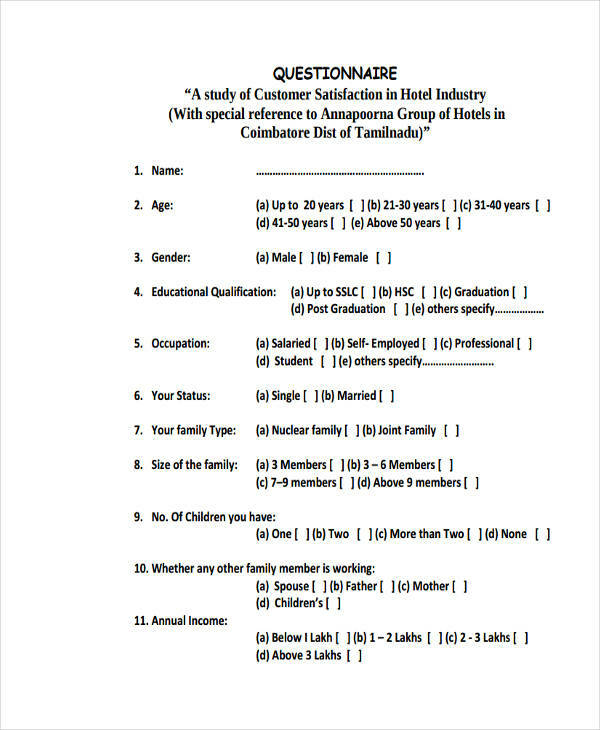 The purpose of the questionnaire is to know how happy your customer and not to advertise. You can also use a feedback questionnaire to gather more information about their satisfaction. Ask one question at a time, Don’t overload your customer with many questions in one number. Let your customer think through each individual question. Use a rating scale system. To get effective results, use scales like, “on the scale of 1-5, 1 being the highest and 5 being the lowest”. Avoid leading and loaded questions. Don’t use questions that lead a customer to think that they are answering bias questions. Be transparent and use open-ended questions. 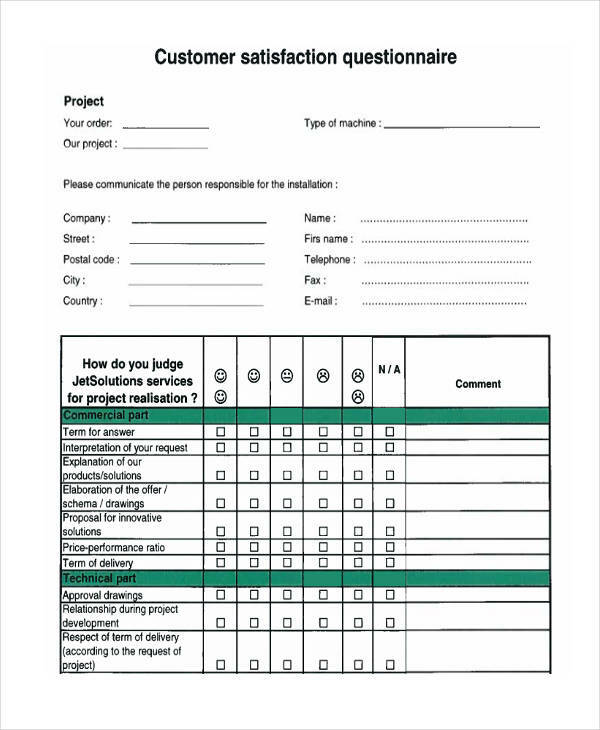 Our customer satisfaction questionnaires in PDF and Word has all the qualities mentioned above. Check them out.